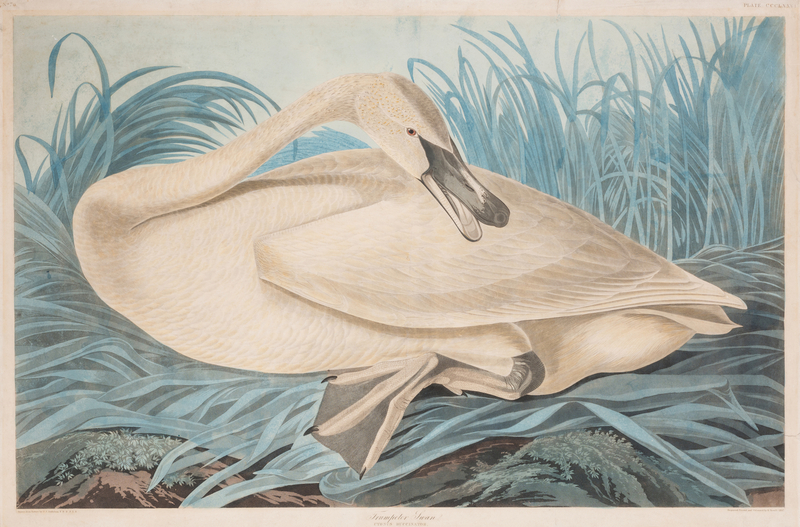 Lot 451: John J. Audubon Trumpeter Swan, Havell ed. 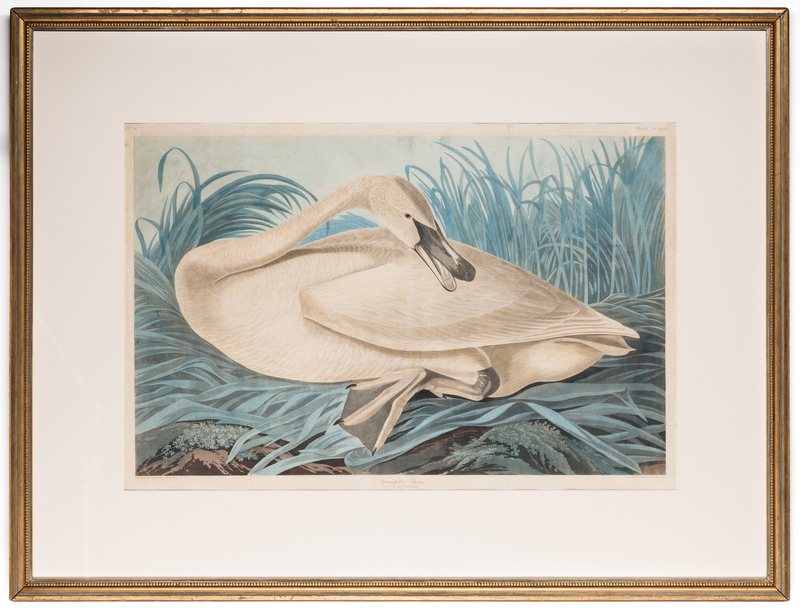 You are here: Home >> August 5, 2017 Historic Summer Auction >> Lot 451: John J. Audubon Trumpeter Swan, Havell ed. John J. Audubon Havell Edition aquatint etching, TRUMPETER SWAN (YOUNG) – CYGNUS BUCCINATOR, plate CCCLXXVI . 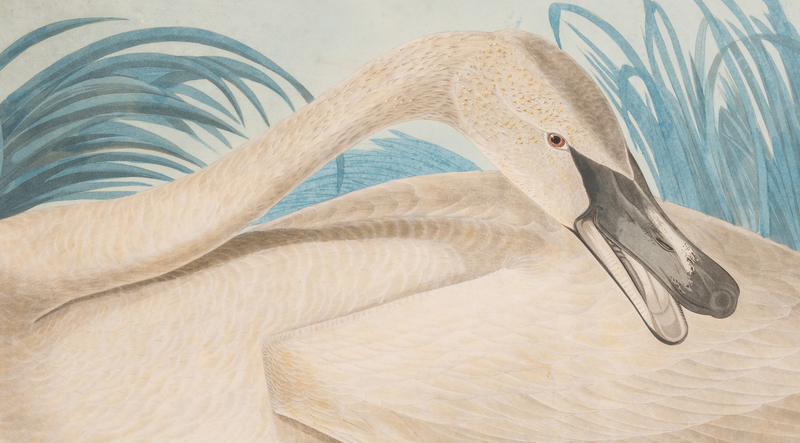 Printed lower right margin: Engraved, Printed and Coloured by R. Havell 1837. (Published 1838). 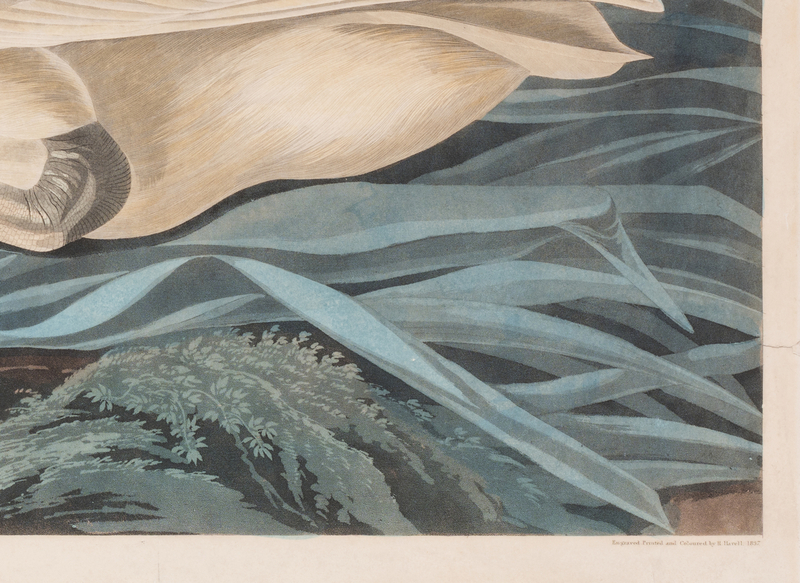 Titled center margin and printed lower left margin: Drawn from Nature by J.J. Audubon. F.R.S. F.L.S. Watermarked J. Whatman 1838. Intaglio and watercolor on paper. 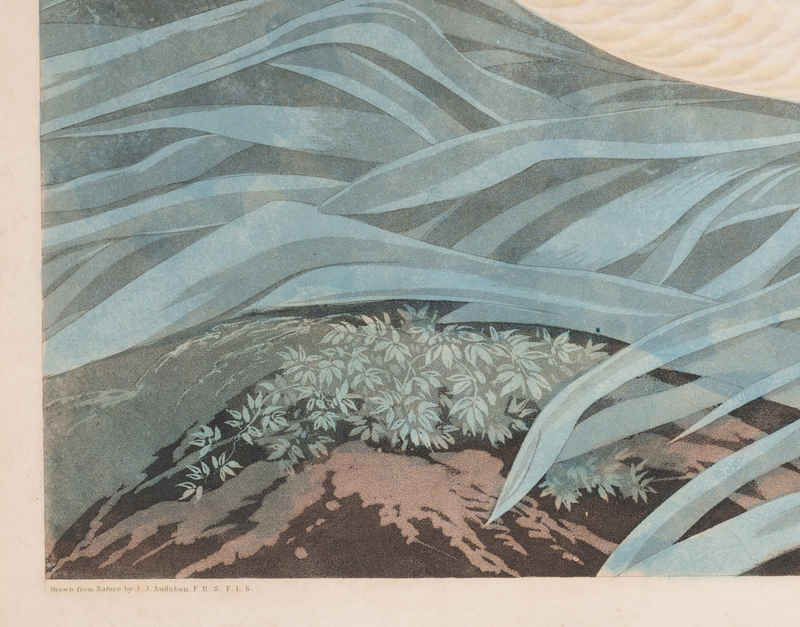 Image – 22-7/8î H x 34-3/4î W. Sheet – 26-5/8î H x 40î W. Sight – 24 1/2" H x 37" W. Framed – 40" H x 52 1/2" W. Provenance: The estate of John Donnelly, Nashville, Tennessee. 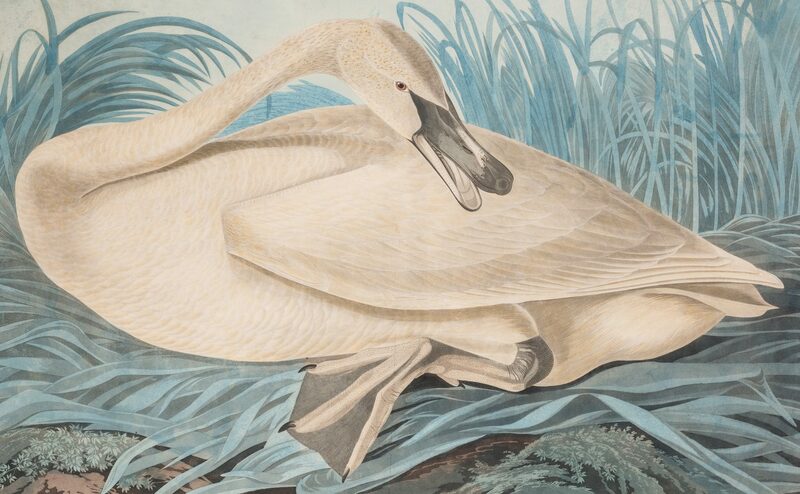 Note: In about 1820, John James Audubon declared an ambitious intent to paint every bird in North America and to fund it by selling groups of printed plates of his paintings to subscribers. He insisted on the bookís large format — printed on the largest handmade sheets available at that time — in order to portray the birds in their actual size and natural habitat. 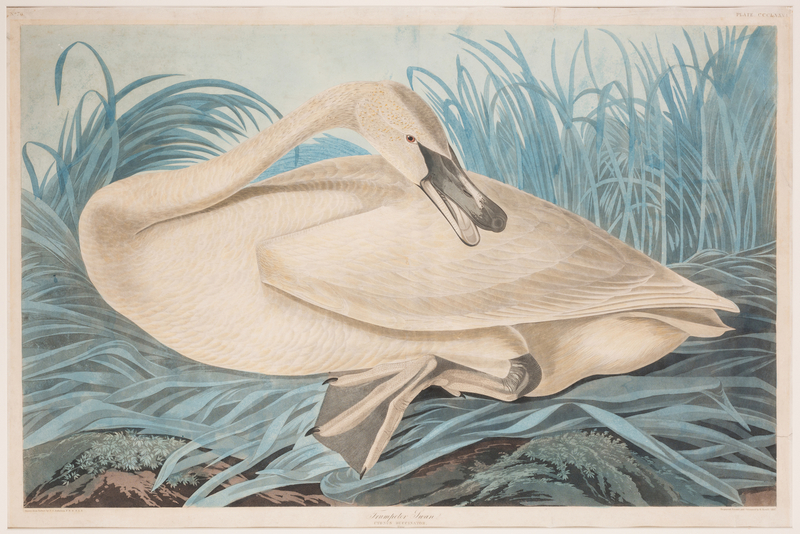 The result was the ornithological masterpiece, THE BIRDS OF AMERICA, Havell Edition, published periodically 1826-1838. There were 435 different prints of 497 bird species and an estimated 180 complete sets were produced; today about 110 (some sources say 120) remain intact as bound book volumes owned by museums, institutions and private individuals. – source: The Audubon Price Guide by Ron Flynn. CONDITION: Conserved in 2014, refer to scan of conservator's report. Note: While conservation did much to stabilize the print by removing the dangerous tape adhesive and acid burning and minimize tears, the loss of original color (particularly to the swanís head) and margin chipping remain condition issues on this print. The decision was made to not recolor the faded areas, in order to maintain the historical integrity of the piece.